Welcome to The Cellar d'Or Wine & Cider Shop! We are located on the famous downtown Ithaca Commons in Ithaca, NY. You can find us in the middle of the commons on the north side across from Mate Factor and in between Mia Restaurant and Mansour Jewelers. Just look for our GIANT marquee lettering that says "WINE & CIDER SHOP". We are open 7 days a week. For more info on finding us and our hours please see visit our deliveries & parking and contact pages. Every friday from 4-7pm we hold fun, educational, and unique free wine tastings. They are themed, but many times are they feature new and interesting wines we carry. Often we have visiting winemakers and industry professionals to pour their wines for you. This is one of the best ways to learn, expand, and sharpen your palate and wine knowledge as we pour many obscure grape varieties from small regions across the world. For more info on our events join our mailing list, like our facebook, or visit our events page. Come visit and see our large selection of $15 and under wines as well as our section dedicated to wines for $10. We also offer a special selection of wines that are discounted down to $10 per bottle when you mix any 6! 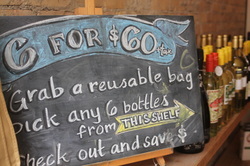 Grab one of our cool, reusable bags, choose any 6 bottles from the many selections on the shelf, and pay $60! It's our now famous build-your-own "6 for $60" deal and it saves you a bunch of $$$! We also have mixed case discounts! Take 10% off of any 6 bottles and 15% any mixed case of 12 bottles or more. Rosé! Crisp & mineral whites! Grower Champagnes & pet-nats! Cider! Cider! Cider! We love getting into spring and summer as the porches start rocking and the grills star heating up. We bump up our selection of summer sippers this time of year to make sure you are well-equipped for taking on the backyard party and summer heat!